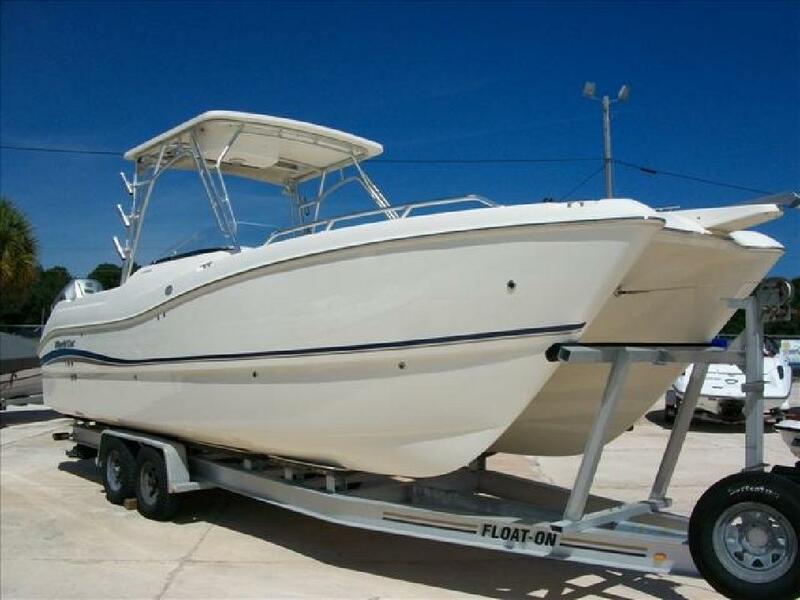 The WorldCat 270 SD is among versatile boats out on the big blue. With lighted live wells and a walk through transom, the 270SD sport deck is the SUV of the boating world. World Cat's patented Vectorflo? hull design will ride the roughest waves and keep you safe and dry. Your crew will appreciate the convenience of the walk-through trasom, spacious changing area with enclosed head, sun lounge seats, freshwater shower and CD player with 6-disc changer. The 270SD's cleverly designed cockpit provides a fishing station with a 250-quart insulated fish box, (2) 25-gallon lighted livewells with 700-gph pumps. Looking for the Catboat that does it all? Look no further than World Cat's multi-purpose SUV, the 270SD sport deck. Length Overall (LOA): 26' 6"